Since I reinstalled Eclipse (simply deleted and downloaded it again) I can't debug my applications on Samsung Galaxy i9001 (with CyanogenMod - Android 4.4.2). It worked fine before reinstallation. [2014-04-15 12:47:06 - DDMS] device unauthorized. Please check the confirmation dialog on your device. Any ideas? Is it possible to generate keys manually without confirmation dialog? It's likely that the device is no longer authorized on ADB for whatever reason. 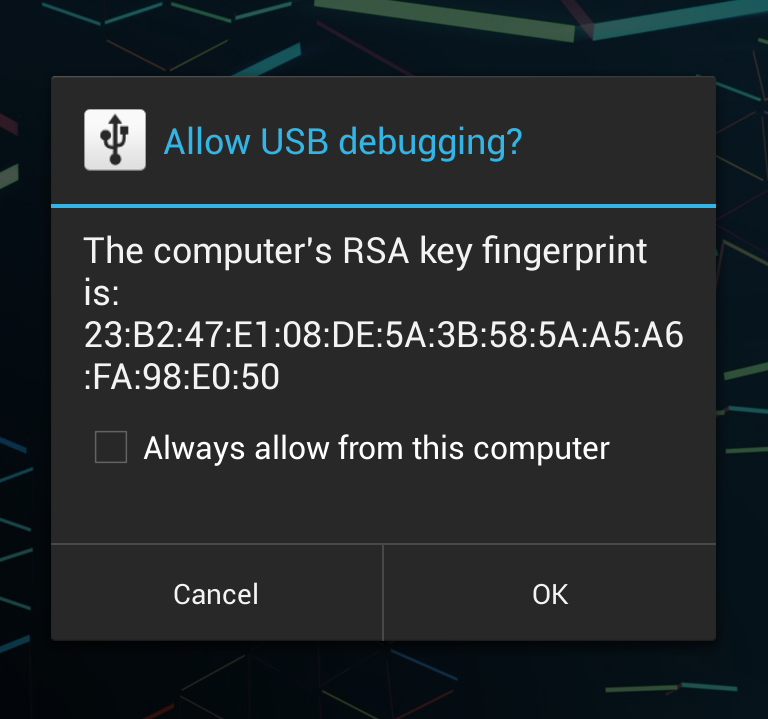 If the device is shown as unauthorized, go to the developer options on the phone and click "Revoke USB debugging authorization" (tested with JellyBean & Samsung GalaxyIII). The device will ask if you are agree to connect the computer id. You need to confirm it. Ohhh finally I figured it out! After removing Eclipse directory I installed it into another directory. has displayed wrong path to sdk directory. I run into the same issues with nexus7. Following worked for fixing this. Open Developer option in the Settings menu on your device. Switch off the button on the upper right of the screen. Delete all debug permission from the list of the menu. Switch on the button on the upper right of the screen. now reconnect your device to your PC and everything should be fine. Sorry for my poor english and some name of the menus(buttons) can be incorrect in your language because mine is Japanese. I wasted hours on this stupid issue. None of the above solutions worked for me on their own. To be honest I'm not sure which of these steps got me my Allow USB debugging? prompts back so I listed EVERYTHING for completeness. Goes in order from easiest to hardest. Most people seem to be back on their feet after the first two sections. I would perform this after each of the sections below. Revoke USB debugging authorizations. Try this while USB debugging is on and if possible try also when USB debugging is off. Unplug and replug USB cable into phone. CAUTION Delete your ~/.android folder. Sometimes this folder can have the wrong permissions which can cause issues. You might want to back this folder up first. 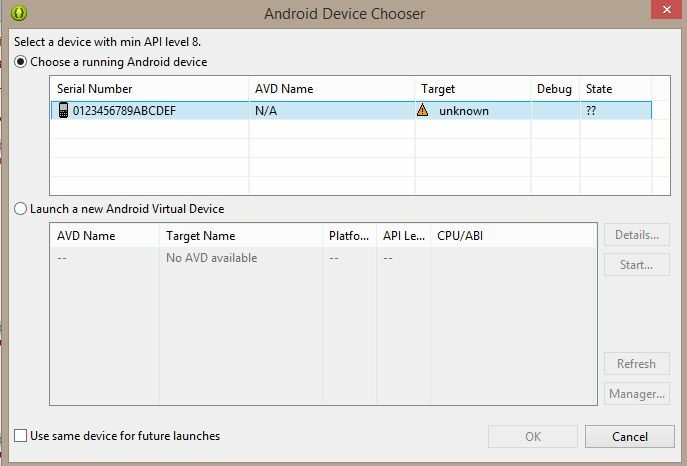 Erase all Android related environment variables. At this point all my devices magically came to life and started displaying the Allow USB debugging? prompts and connecting properly through ADB. If you've made it this far and haven't found a solution, I am truly sorry you're in this predicament. Make sure you've restarted all devices and your dev machine at the end of all of these steps and connect to a fresh USB port using a new cable. 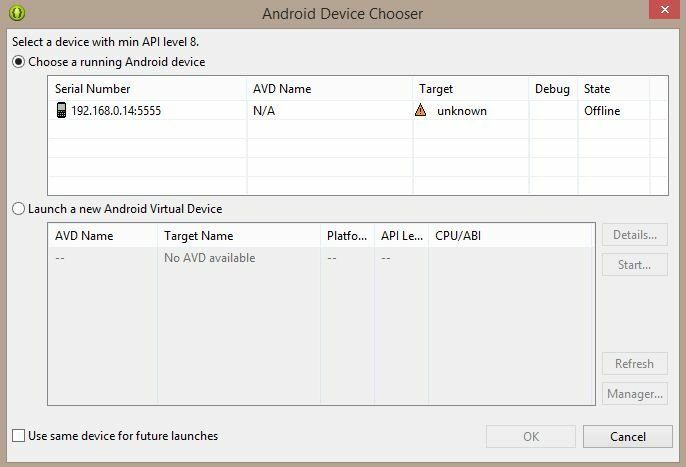 How to solve ADB device unauthorized in Android ADB host device? For reference, I just encountered much the same issue on Linux and had a hell of a time figuring it out. I eventually determined that I had a ~/.android directory that was root owned (thanks to running adb as root, while flailing around trying to figure out other connection problems). Deleting that root owned ~/.android directory resolved the missing authorisation dialog next time I reconnected the device. The most important part was rebooting the device. Didn't work without it . As the message have stated, you need to allow the adb access on your phone. You need to first connect the phone to your PC with USB cables, then the authorization message will pop out on the screen. Tick remember your choice, then allow it. IF your device doesnt shows any messages when connected to the PC.Just do this. Remove /data/misc/adb/adb_key, reboot your phone and try connect again. The message should come up. I was getting this error with my Nexus 10. I tried all of the answers I could find, and then I realized I was using a different USB port than usual. I switched to using the port I usually use, which is on the other side of my laptop, and the authorization popped up on my tablet! I was tiered with this, I got that permission dialog by turning off wi-fi of my phone. Had similar issue on osx and Nexus 5 (A6.0.1). I did get the authorization pop-up and confirmed it, despite that Android Studio nor any other IDE could connect to device. Turned out my Nexus (rooted) was missing key files. I was not getting the RSA fingerprint pop up on my phone. files, delete those and then do kill and restart of adb server. I had to stop and restart the debugger and connecting as USB in PTP mode. Because the RSA authorisation key was getting stored in this path, killing and restarting the adb server didn't help. The solution is to copy your file ~/.android/adbkey.pub (on GNU/Linux, or %USERPROFILE%\.android\adbkey.pub on Windows) to Android, and place it as /data/misc/adb/adb_keys. You need root privileges to do that. You can transfer the file any way you like (or are able to), be it USB, e-mail or a temporary file upload service. In my case, as it was a new Android-x86 installation in a Virtual Machine, no usable web browser, and with network/TCP adb not working, I had to actually type in the 715 characters. After this I didn't even need to unplug my phone: the authorization prompt was already there. Good luck! On some Samsung devices the mode change that can be set by dialing *#0808# doesn't stick without direct reboot. Once rebooted, dial the same string and make sure that you have adb + mdp selected and USB set to AP. After this make sure to reconnect phone and restart ADB server. Also try to avoid USB hubs and virtual machines witch surely complicate matter further. The follow the previously mentioned instructions for clearing authorized devices etc. 2.- Once the phone is plugged in USB Debugging mode, A message appears asking you to authorize this computer for debugging. You have to mark "Always allow this computer", and click on Allow. This is error because your window version haven't driver for usb 3.0 to receiver authenticate permission from phone. I spent 5 day with this bug. Now, install 58964_Intel(R)_USB_3.0 driver. And continue with awesome code! After installing Android studio, I had incorrect permissions on the folder "~/.android"(access for reading and writing only for root). So I changed it and ran project from Android studio(device still was marked as "unauthorized"). Android studio showed an error "Error installing apk", but in the folder "~/.android" were created files "adbkey", "adbkey.pub", "debug.keystore". After that I restarted adb (ran commands adb kill-server and adb start-server) and authorization dialog appeared on my device. Hopefully someone will approach this solution. What I've done to solve the issue was to disconnect and reconnect the usb cable to the USB port again (done with another port on my machine). Then I have chose to charge and that's it. The mobile device asked me to grant access for the machine, I agreed and that's solved the issue. When running adb devices, I saw the device in the list. (Done in Windows 10 home). I was stuck on this for quite some time, and I was able to side-step the issue completely by copying the adbkey from a computer that my phone would connect to. This may be because I am not using normal end User device, working on corporate device! I tried many ways to solve this problem, this one works for me. Not the answer you're looking for? Browse other questions tagged android usb adb device unauthorized or ask your own question.